Drawing on more than 30 years experience as a professional musician, Michael Fitzsimmons has developed a multi cultural residency program closely related to his Drums of the World concerts. This is one of Michael’s most popular residencies. Dynamic and powerful rhythms are explored with hand constructed frame drums. These drums can be complemented with 'found sound' instruments. Students keep the drums and instruments they create. During this residency participants explore beyond conventional boundaries, discovering sounds and rhythms. Rhythm is everywhere, and we learn to discover and appreciate its powerful pulse. 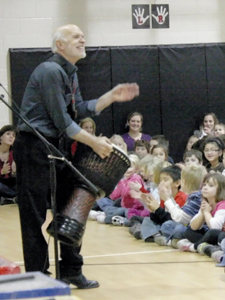 Personal experiences are enriched utilizing story, decoration of the student's drums, and group interaction. Traditional multicultural rhythms (Shiko, Clave, Afuche, etc.) are also taught. Drum circles and final day student performances with Michael incorporate the workshop lessons. This residency is accessible for all grade and development levels. This is a fun, joyful program that releases stress, removes boundaries, enables nonverbal communication, and builds teamwork.